In this ACT science strategy lesson, we are going to talk about something very important to getting a top score on the ACT Science Test, and that is how you should strategically use your answer choices. 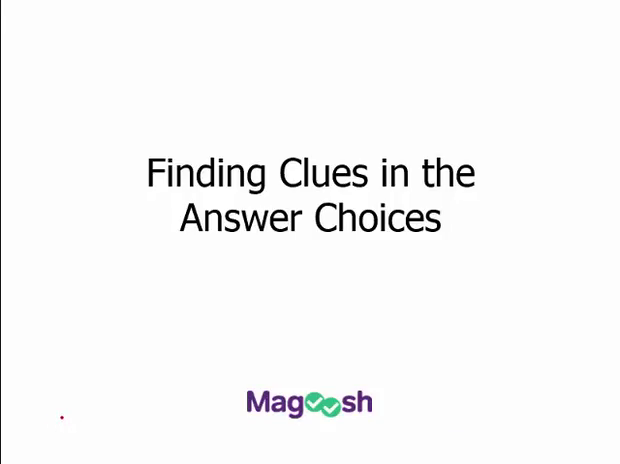 Basically, what are the clues that you should be looking for in your answer choices that will help you find the right answer more quickly, avoid being tripped up and save some mental energy. So first, let's talk about why you should be looking for clues in the answer choices in the first place. If you're a good student, you've probably been trained to methodically answer questions on your own with no help. You may occasionally get multiple choice tests in school, but even then most of you probably go through the entire process of solving the problem as you would a question with no answer choices. And then looking to find your answer in the choices you see. And this is a habit that many students apply to the ACT as well. The problem is, on the ACT, you have this wonderful present all wrapped in a bow in front of you. The answer to every question is sitting right there. You just have to pick it out of four. So take advantage of this gift and work on developing a new habit. And that is treating the answer choices as part of the question, as something to look at before you try to solve the problem. I'm going to give you four major reasons why this is so incredibly helpful to do and the first is because the answer choices will often point you exactly where you should look. So here's a simple illustration. Let's say you're looking at a science passage with graphs that look like these. Our question asks us, what's happening to things? If you read a question like this, you might be tempted to go straight to the passage and find the term things. And if you went back to the graphs in this particular hypothetical passage, you would find two different graphs that both include data on things. So, you don't know which one to look at to determine the comparison. So then you go back to the question. But you can save yourself this step if you consider your answer choices to be part of the question, and look at those first. You'll see that all of them include a very important term, and that is volume. Which only appears on the first line graph and not the second bar graph. So we know right away where to look. You'll see problems like this again and again on the ACT. Similar labels or measurements are used on several different tables or figures. And it's the answer choices that are going to give you the clues for where to look. Reason number 2, why you should look at the answer choices first, is because the answer choices can help you focus on what is important for you to be figuring out or analyzing in the question. So, let me show you an example of a question you could actually see on the ACT. An individual with the alleles IB and IO, and HH can receive of which of the following types? Now, we aren't actually going to solve this one. I'm going to let you practice with another question in just a minute, but I want you to notice the answer choices. You see how B appears in all of them? And O does as well? That means that any work we do to figure out whether an individual of this type can receive B or O blood is a complete waste of our time. It won't get us anywhere. The only things that are different between the answer choices are Bombay and AB. So that means we need to be looking to the passage only to find out whether the person in our question can receive AB or Bombay blood, which hopefully cuts down on our work and allows us to hone in more quickly on what is important. All right, it's now reason 3, why you should look at your answer choices first is to prepare yourself for a potential trap. I don't normally like to use words like trap or trick with the ACT because, in general, I do think it is one of the friendliest standardized tests out there. The ACT, on the other hand, is far more likely to jump you in a dark alley and take all of your money, but I digress. But it's true that this test is very good in anticipating how you might incorrectly solve a problem and you can bet that you will see those as answer choices. It also makes it a little bit easier for them to write tests, where answer choices are exact opposites. So you're gonna constantly see answer choices that look something like this. Gobbledygook increases as Schmuffins decreases. Gobbledygook increases as Schmuffins increases. Gobbledygook decreases as Schmuffins remains constant. Or, Gobbledygook remains constant as Schmuffins decreases. When I see something like this, it's a trigger for me to be very, very careful. I want to make sure that I am looking at the right values, that I didn't mix up Gobbledygook and Schmuffins on the charts and graphs. I want to make sure that I am looking at the trends in the data in the right direction. I wanna make sure I'm double checking the question and answer to make sure I read it right. Because if I didn't, I'm going to get this question wrong, even if I do understand what's going on in the experiment. So answer choices like this put me on high alert to make sure that I didn't make a mistake. But then, I can feel super smart, and give myself a little pat on the back when I get it right, and know I didn't screw it up. All right. And here is my absolute favorite way to use the answer choices to solve problems on the ACT science test, particularly on difficult questions. Because the values in the answer choices can often help you solve the problem. So let's look at an example ACT problem to illustrate exactly what I mean by this. And this one we are going to work through together. Let's look at the question and answer choices first, since this is what we are training ourselves to do on the ACT. Given the data in the passage, the speed of light through a hypothetical material with an index of refraction of two would be approximately 6 times 10 to the 8th meters per second, 3 times 10 to the 8th meters per second, 1.5 times 10 to the 8th meters per second or 1.5 times 10 to the 4th meters per second. Okay. So let's think about what we can learn from the answer choices. The question which you ask yourself is, where are they getting these numbers? There's a pattern to the numbers here. 6 is twice as large as 3 and 3 is twice as large as 1.5. We can also see that three of the answer choices say 10 to the 8th meters per second and one says 10 to the 4th. We can look at answer choices like these and know that the ACT didn't just pull these numbers out of thin air. There must be a reason why they think you might wanna pick half of a number or twice of a number or half the exponent of 10. This provides us a valuable immunition when we go to attack the question. So, now let's look at the relevant part of the passage. Here we are. Now, I want you to pause the video and go ahead and take the time to read this excerpt. All right, so now let's put side by side with our question and see how we can use the numbers in our answer choice to help us. Our major numbers in answer choices are 6, 3 and 1.5. So, now that we have the passage, let's think about where these numbers come from. Aha. Right here, we have the speed of light, represented as c, is approximately 3.0 times 10 to the 8th meters per second. The question is asking us, what the speed of light through a hypothetical material with an index refraction of 2 would be? So, you know, using a little common sense, I'm going to guess that it's probably not going to be the same as the speed of light in a vacuum. And in fact, the next sentence tells us this. Light only travels at this speed in a vacuum. When light travels through other materials or optical media, it moves more slowly. Slowly is key to answering this question. If it's moving more slowly, then we need a value that is less than the speed of light, less than 3 times 10 to the 8th meters per second. So we can rule out a, 6 times 10 to the 8th meters per second. Okay, so the other key part of our question is the part where it tells us the index of refraction of the material is 2. So we need to look at what it tells us about indexes of refraction in the passage which is right here. We have this example about the refractive index of glass which is 1.5. Which means that light travels 1.5 times faster in a vacuum than it does in glass. So we need to bring in a little bit of math knowledge of exponents here. Refractive index of 2 would therefore mean that the light would travel twice as slow through this hypothetically material than through a vacuum. So it should be then half the speed of light. Which would be 1.5 times 10 to the 8th. So our answer is c. 1.5 times 10 to the 4th meters per second would be a lot less than half. But, you can bet that this answer choice is there because the ACT is wondering if you're gonna try to half the exponent 2. Which we shouldn't do. I've used this strategy again and again on questions on the ACT looking for where the ACT is getting its numbers from rather than just going about trying to solve a problem can often be a much smarter way of solving an ACT science problem. Particularly, a difficult one. Or it's a great strategy if you ever get stuck as well too. If you can't find your questions, key terms in the passage, if you don't know where to look, see if you can find the numbers that are in the answer choice. Okay. So to recap, use your answer choices. They are there to help you. Even if it is only because the ACT had to make a multiple choice test. The answer choices can tell you exactly where to look. The key terms in the answer choices are just as important as the key terms in the questions. The answer choices can help you hone in on what's important. What's different about the answer choices? What is it you really have to answer? Reason number 3, to put yourself on to watch out for some potential trickiness, particularly answer choices that are exact opposites. And finally, to use the clues and the values of the answer choices to help you think like the test makers and solve difficult problems. So that's it, happy hunting for clues.